I used to have a game called Tales of the Crystals I would play with friends. It was pretty much a box of plastic "crystal" necklaces, a cassette tape that told a bizarre story laden with giants, fairies, ogres, sprites, you name it. I even remember Old Man Oak, and luckily there was a huge tree in my yard that was deemed Old Man Oak even though I'm sure it wasn't an oak tree. Other than that, it was strictly imagination how you would accomplish the tasks given to you by a talking tree and a fairy. The best part about that game? You were required to build a fort that was "home base." We would accomplish lots of tasks in that fort and definitely had to have ammunition to keep ogres away. You don't want those in your fort at all! I wish occasions as an adult called for building forts but alas, there are not unless you are in the military. My dad also used to bring refrigerator boxes home from work and would cut out windows and doors and tell me do draw on it to make it a house. Pretty much, if I had a little hideaway like that to always go to, I would be golden. I'm seriously thinking of turning my balcony into a fort for a lazy weekend. I've asked my boyfriend to build me a fort but I haven't seen one yet...so I might have to take matters into my own hands and get some clips, sheets and rope and drape away. 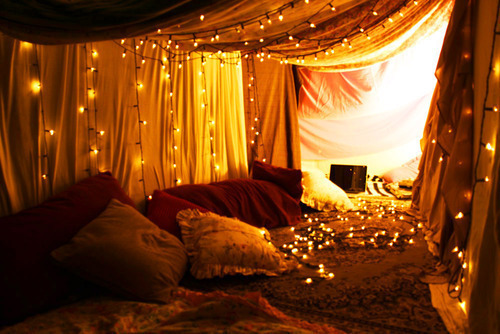 I might even turn my entire apartment into a massive fort. I would have to buy lots more sheets though! After seeing these wonderful places of solitude, I'm dying to let out my inner child (it's never that far away really) and get to making a nice fort. Just fill it with things to occupy you...a laptop, book, games and LOTS of pillows. A table fort can be easily hidden with rolled fabric, window shades or paper tucked underneath. Lights are really what makes a mish-mash of sheets and blankets look pretty. Twinkly lights are even better. This fort takes the cake, it's so elegant and put-together! Another elegant adult fort that would be perfect for an outdoor evening picnic.